Sorry for the disappearing act last week (5 parts into a 7-part reflection!) – but I’ve been horribly ill since last Wednesday night and I haven’t had much brain space for blogging. I’m pretty sure that I’ve had the flu, still have the flu for that matter, though the Dr. wouldn’t say much about it when I went into the clinic on Friday to get a prescription for an asthma inhaler – something I don’t normally need but the cough with this thing has done a number on my lungs, not to mention my sinuses, my ears, my throat and every muscle and joint in my body. After two years of taking almost no sick time, I am now on day five of sick leave since January 1st – making me glad that I’ve got it to use, but disappointed because I was hoping to get to year end in March without having used any! So yes, I’ve been bed-ridden. But lucky for me I (mostly) haven’t been so sick that I can’t sit up and do things like read, and hand-sewing. The first couple of days were spent mostly sleeping, but since then I’ve been intermingling bed-appropriate activities with my naps – I would be going crazy if I didn’t have some vestige of “productivity” at hand otherwise. I also have been able to be at my sewing machine for an hour at a time (not longer, I get dizzy) on a couple of days – so that’s been a nice break from bed. 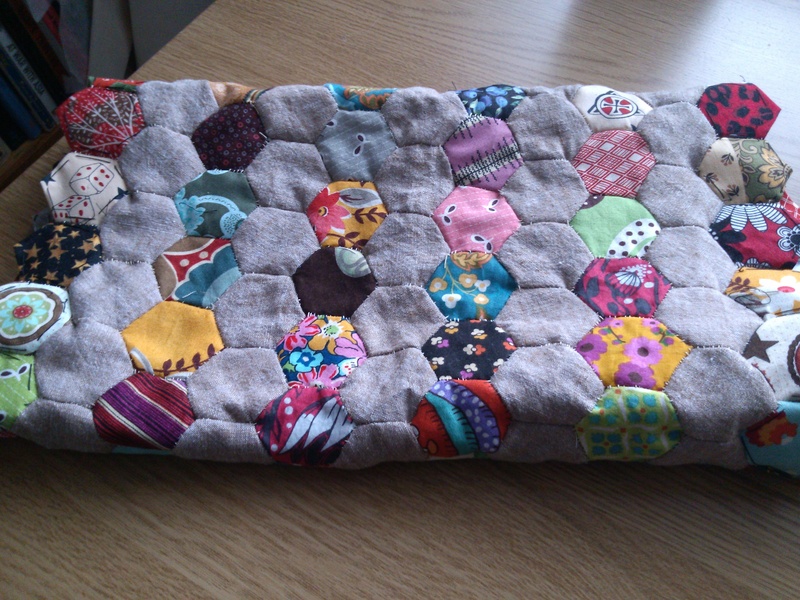 Up first is this table runner that I started hand-piecing early in 2013 and then left to languish. Last night I finished the last row of piecing and now it sits on my sewing table awaiting borders and quilting.That’s 253 hexagons paper-pieced and stitched together – my first substantial pieced work by hand. 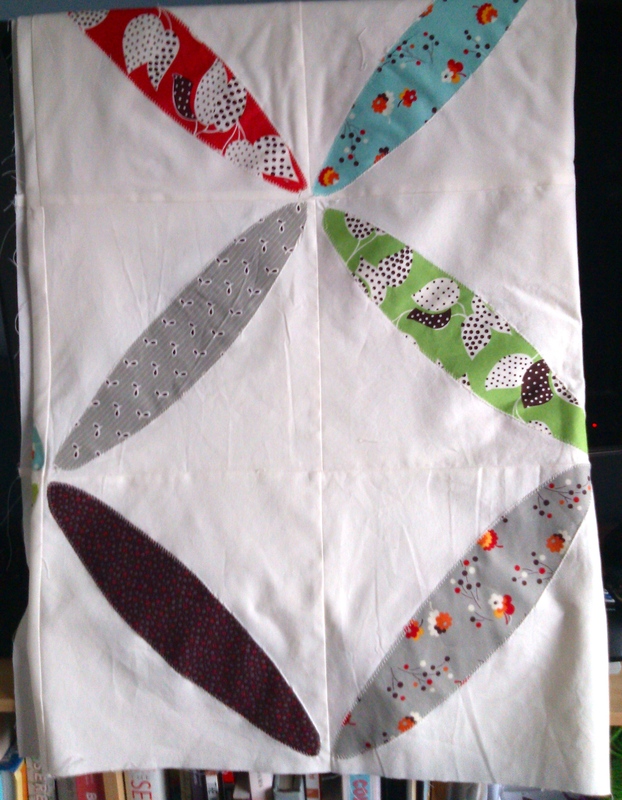 It doesn’t look like much here – but once it’s ironed and finished — so excited! Like the above photo, this item is folded so you only see part of it. Also like the above, I started this way early in 2013, cutting out the petals and the background fabrics. Originally intended as a gift, I decided at some point that it was way too much work to give away and so set it aside to complete for our bed….. And now finally, I have started work on it again. Mostly I did these squares before I got sick, but yesterday i managed to sit up long enough to put together another row and have now got half a queen-sized quilt pieced. I hadn’t done any crochet since getting sick because the stuff I wanted to work on requires too much concentration – but last night I decided to give this pattern a shot – completing a motif I started in December, and finishing a whole second one as well. 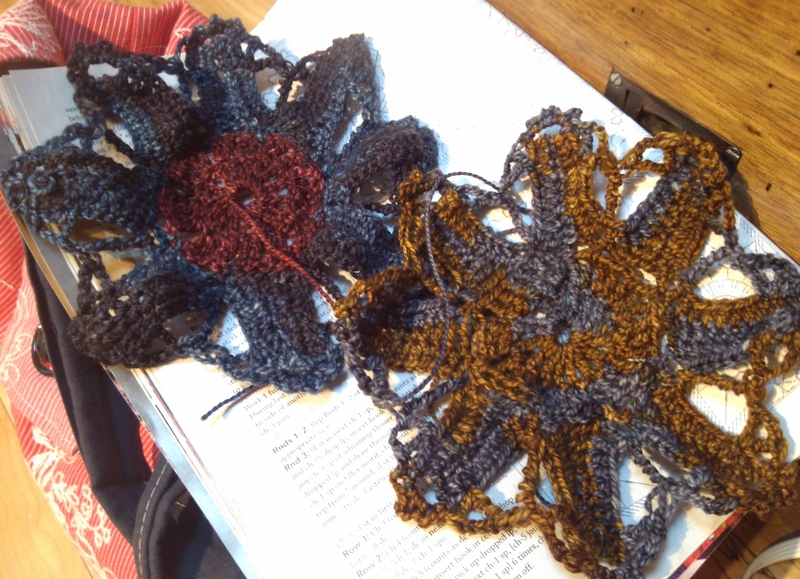 Twelve of these plus a few other motifs will eventually make up the Bloomsbury top. I’m hoping to get a couple more done today. I’m feeling a bit quilt-crazy at the moment and thinking that 2014 may have a fair bit more home sewing in it than 2013 did. We’ll see. Something I have been thinking about in the least little while is turning more of my attentions towards textile arts once I finish my Master’s degree next year. I’ve been deriving so much pleasure from the limited work I do currently and I’m thinking that would be a natural place to expand my skills and energies.